Should you need a book for any of those aforementioned contexts, this one is cute enough. 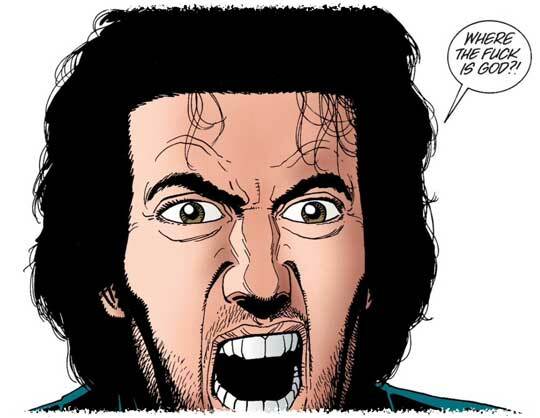 At this point, I feel like it's pretty safe to assume that if Garth Ennis was involved in the writing, production, or even coffee-fetching for something, then it's probably not well-suited for children. Actually, if you can be offended by almost anything, then you should probably cease and desist with reading this review right now. 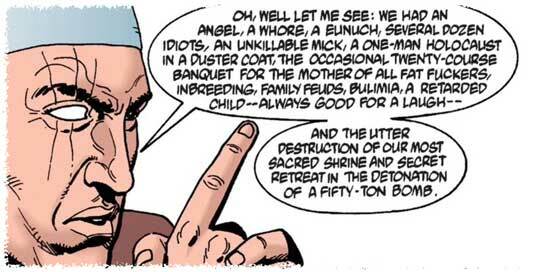 Ok, now that I've whittled my audience down to only the truly depraved, I can freely admit that this third volume of Preacher was awesome!! * Sick and twisted? Yes. Fun to read and chock full of badass artwork? Also yes. 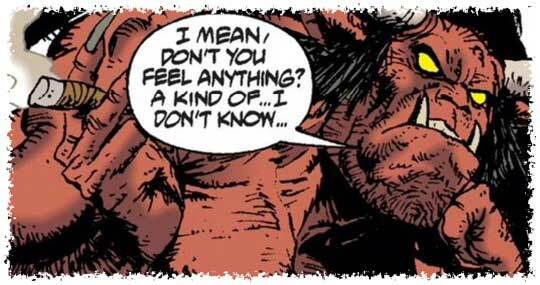 As one might have guessed based on the cover, we start off this episode alongside The Saint of Killers (if you need to brush up on this character, his biosketch is in my book 1 review). And we all know that dude's one terrifying mofo! What we don't know, however, is how he got that way— everyone loves a good origin story. 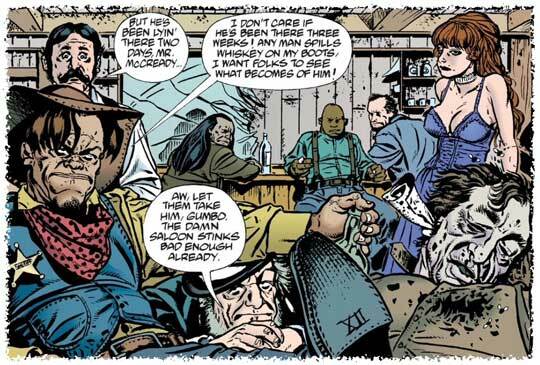 And Ennis creates one ugly picture (both figuratively and literally) when it comes to Gumbo McCready. Of course, the Devil is also involved (whose banter with the Angel of Death, and general malaise reminded me of Satan and Saddam in South Park). 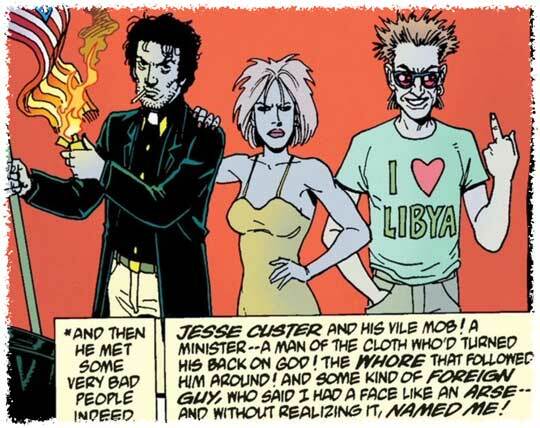 Flash over to where we were at the end of Preacher Book 2, and you might recall that the trio of Preacher Jesse Custer, Tulip and Cassidy (aka Cass) were involved in a whole other scene of trouble. I suppose the summary of said events depends on who you ask. Herr Starr, for one, can always be counted on to put things delicately. For a different perspective on what our favorite trio's been up to, we could also ask Arseface. * There's been some confusion in the past about which Preacher book contains which volumes etc., so I apologize if I'm a bit out of whack with your third Preacher, but, you'll just have to deal with it. Not too long after finishing Americanah, I chanced upon this graphic novel when perusing my local digital library. Conceptually, I love the idea of a graphic biography and (this is where the Americanah thing becomes relevant) was particularly interested to see how one might take on a racially-charged discourse. Given the amazing, iconic images of the Civil Rights movement, my expectations were pretty high. As you may have guessed from my dearth of stars, I was a bit disappointed. First of all, I don't know how 112 pages could feel so long, but they did. If it weren't for library due dates, I might still be trudging through this. The author begins by challenging Malcolm X's autobiographical truth, which is fine- but things just felt "weird" (for lack of a better term). There was a way in which the narrative seemed couched in certain racial clichés which, again, is fine (I'm no expert, and facts are facts- I found this review to be much better informed than anything I could produce), but there seemed to be a lack of nuance. Malcolm's mother is the black woman, too proud to take handouts, willing to see her children suffer to such an extent that the "safety net" of the state had to swoop in to take control. As Malcolm moves to the next stage of his life, he learns to live the life of the hustler which, among other things, involves getting your hair straightened- a moment that comes off as being clownish in manner. It was also at this point that i lost all ability to discern characters visually. I get it, Malcolm was evolving, but it was downright confusing. For example, in the montage cell below, is that supposed to be Malcolm three times? If so, which one(s) is/are he/him? The story arc I enjoyed most, visually speaking, was Malcolm's becoming disillusioned with Elijah Muhammad (of the Nation of Islam- NOI). Here, the illustrations give the reader a hook to just how different a person can seem as one's understanding evolves. One might think that, having escaped the clutches of the family from hell (metaphorically) in Angelville (literally), Jesse (AKA Preacher) and Tulip would be happily nesting somewhere yonder, unless, of course, you've been paying attention to what actually goes on in these books, in which case you'd be well-aware that there's always more bedlam at hand. Jesse and Tulip have been hitting the sheets (and any other surface they can find) in a hotel in San Francisco where we meet up with our favorite Irish sanguisuge, Cass. They're not the only ones in town though. The death of Cass' long-time gal by OD leads our trio to the house of a pale-faced, hedonism-obsessed billionaire by the name of Jesus de Sade. Depraved doesn't begin to cover the likes the infundibular activities in that house, so I'll just give you a peep of a typical morning in the breakfast nookbefore any of the real debauchery begins. Jesse, meanwhile, is in the sights of Herr Starr, a disfigured head operative of The Grail, an organization whose mission, activities, and corpulent leader are beyond me to describe. When Cassidy claims to be Jesse to save his buddy's hide, Preacher's gotta mobilize and infiltrate the Grail's HQ, Masada. Oh, and don't forget that a certain deity is still MIA- so toss that into the mix and you've got a recipe for madness the likes of which a healthy human mind should not be able to readily conjure. While I'll undoubtedly be going back for more, the Masada mission didn't elicit the same kind of visceral je ne sais quoi for me that Angelville did. The background on Jesse's dad in 'Nam and Cassidy's origin stories were good time fun. This one's still a raucous explosion of incredible art and the darkest of humor, but I give it 3.5 out of a Preacher-adjusted possible 5 stars. Oh and a bonus (albeit sacrilegious) head's up from good ol' Cass for anyone wanting a vampire's take on the Almighty.